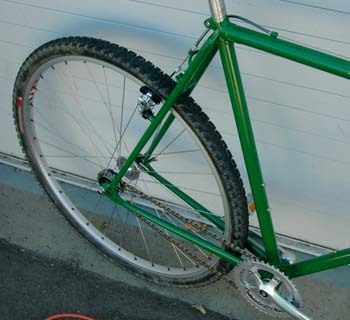 The Quickbeam is the newest complete bike to be offered by the folks at Rivendell. My company has been working with Rivendell for the last eight years, helping them develop products in Japan. I had the good fortune to be involved in the Quickbeam project and I'm really glad to see it come to fruition. When Grant Petersen and the crew at Rivendell started work on this project, their objective was to produce a simple, practical, beautiful bicycle. They named their new baby for one of the woody ent folk in Tolkien's trilogy, and they looked for inspiration from the old English single speed path racers rather than from aluminum track bikes and such. I may be biased, but I think that they made a very nice job of it. The Quickbeam has some neat twists. For a start, it should really be called a two-speed. It comes specced with a single 18T freewheel in back and 32 and 40t chainrings up front. 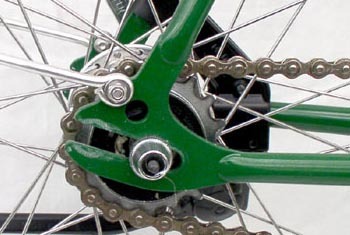 The effect of using two rings is similar to that of a flip-flop hub, but gear changing is a bit quicker, since you don't need to take the wheel out of the frame to switch rings. Instead, you loosen the quick release and slide the hub forward, giving you enough slack to slip the chain over. Then you pull the hub back to tension the chain, close off the QR, and off you go. The hub is threaded on both sides to take a second freewheel. Four speeds anyone? Although Rivendell decided not to spec a true fixed gear hub with a lockring, the Q-beam is still eminently fixable. The 120mm rear spacing makes fitting a track hub an easy proposition. The frame is available in 54, 56, 58, 60, 62, 64 and 68cm C-T. All brazing is carried out by the bicycle division of National Panasonic Bicycles in Japan. The name 'Panasonic' might have you thinking of electric appliances, but in fact the company has been in the bicycle business since way back in the 1920s and has sponsored and built framesets for European road racing teams. The same high-end builders will be working on the Quickbeam. 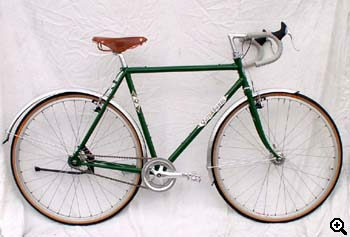 The bikes should available from Rivendell by late Spring 2004. George Gumulinski lives in the San Francisco Bay Area, thinks about bikes too much, pedals too little and is currently working on reversing that equation. Photos © 2003 George Gumulinski. Much more good stuff on the Rivendell site.